Appellation or Vine Colli Euganei D.O.C. It has a ruby purple, intense colour. The bouquet is ample and rich with hints of fresh grass, blackberries, chocolate, cinnamon, coffee and licorice; in the mouth the tannins are evident and balance well with the fullness of ripe cherry and blackcurrant, that flow into a long finish. To wait for at least four or five years. The Cabernet and Carménère grapes grow in the brightest locations, on calcareous soil in order to reach maximum concentration. On the steep slopes of Arquà Petrarca, to accommodate the natural, wavy perimeter of the hill, the rows are planted at "girapoggio". 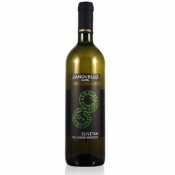 This wine of deep character is aged for 2 years in 500 liters barrels, then in large oak barrels until bottling. It comes from 3 hectares of land "inhabited" by 15,000 vines that do not yield more than 1 kg of grapes each. Ca' Lustra is a path in an area that is not famous, nor talked about, but unique for the strong character of its land and for the great natural and historical significance. It is since the late sixties that Ca'Lustra enthusiastically puts every effort into the Euganean viticulture with the objective of quality: a fascinating adventure led by Franco Zanovello both in the vineyards and in the winery with the help of motivated employees. The 25 hectares of vineyards, and other 15 of olive trees, woods and pasture, are all within the Euganean Hills Regional Park, divided into various "cru" with particular soil and climate characteristics. Deep knowledge of the area, never ending study and experimentation, combined with the historical research, are at the root of the winery’s personality. Important meat dishes, aged cheese. An excellent pairing is with the traditional Venetian duck preparation, in the “salsa pevarada”. Best served at around 18-20°C. The bottle should be uncorked a couple of hours before serving. Keep in a dry, fresh and possibly dark place, laid horizontally. It will improve with ageing, for at least 8-10 years.